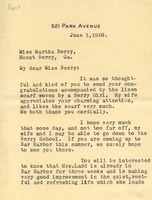 Berry asks Green to come to the school to teach the students how to produce more artistic weaving, "the kind of things that will sell." 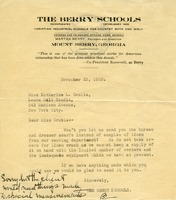 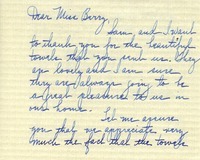 Grable returns a letter from The Berry Schools with a note that her client requires that woven items be made to special measurements. 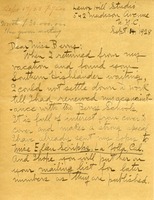 Grable comments on the recent issue of the Southern Highlander and suggests that a prospective donor, Ellen Scripps, be added to the mailing list. 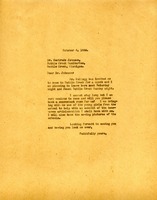 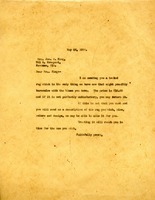 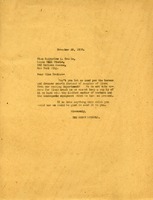 Grable encloses a partial payment of her scholarship commitment and sends thanks for hospitality shown the 1928 Pilgrims. 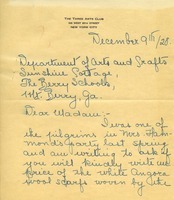 An annotation on the letter indicates that Scripps is quite wealthy but has not contributed to the school. 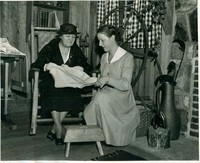 Grable is asked to accept bureau and dresser scarves since the weaving department does not keep a supply of the linen material she requested samples of. 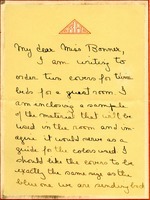 Grable requests weaving samples for a client and forwards a letter from a friend who is interested in the schools. 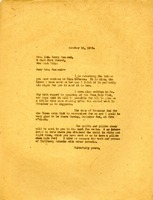 She reports on conversations with Mrs. Newcomb and Miss Ruth Draper, who has accepted an invitation to the dinner. 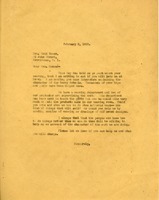 Mrs. Marshall Field has also accepted.